Stingray was the fourth Supermarionation series from Gerry and Sylvia Anderson and aired from 1964-1965. It followed the adventures of the (very stylized) submarine, Stingray, and her crew. Marina is the daughter of Emperor Aphony, ruler of the peaceful undersea kingdom of Pacifica, but when she first encounters the crew of the Stingray, she is the slave of the tyrannical King Titan of Titanica. 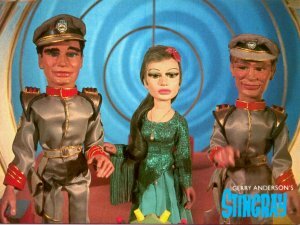 As cool of a character as Marina is, she is a little bit of supermarionation cop-out. Her undersea race is mute and only speaks through telepathy. You don't realize how much you appreciate a puppet's mouth movements until they're nonexistent. This figure is pretty great and adds to the 1990's resurgence of supermarionation popularity. I only wish Matchbox would have continued this trend and produced more figures. I actually really enjoy the small scales, 3-5 points of articulation, and retro packaging. There are so many more properties I would have loved to see done in this style, but that is just a pipe dream now. Let's check out Marina in detail below! Here is an image of her appearance in the show. And here are two video clips from the show. The first is the intro (no Marina) and the second is the closing credits sequence (which does feature Marina). She is a cool figure Alex, & I'm very thankful for the one you sent me...which I plan to turn into Tintin from Thunderbirds. I always loved the Supermarionation shows. All the exploding miniatures, the real human hands appearing at times...so much fun! I have Marina up on the shelf next to Lady Penelope at the moment. Penelope wasn't the best figure. They could have given her a cooler hairstyle. No problem, glad to help out! Yeah Penelope wasn't the greatest outfit or hairstyle choice, but she's still a happy addition to my fledgling supermarionation collection. Still hunting down the Terrahawks myself. They tend to be a bit pricier than the 1990s' figures.